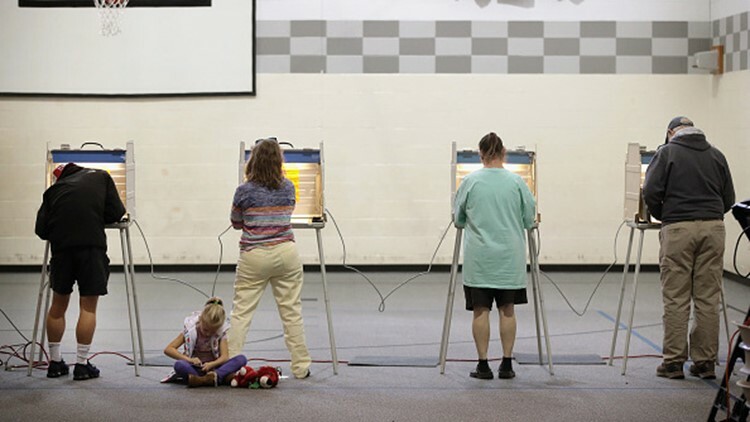 Voters cast ballots at a polling place on November 6, 2018 in Kirkwood, Missouri. Voters across the country are casting ballots in a midterm election that couuld change the ballance of both the U.S. House and Senate. Governor Larry Hogan seeks to stave off challenger Ben Jealous, two important ballot questions and dozens more local races are at stake on Mid-Term Election Night 2018. Maryland re-elected Governor Larry Hogan and sent numerous Democrats back to the House and Senate, both in U.S. Congress and at the state level. Maryland voted for assigning gaming revenues specifically to the state's education fund and in favor of allowing people to register to vote on the same day that they cast their vote, widening access for people to contribute to the political process. But it wasn't without issue: Polling locations in Prince George's County ran out of paper ballots, leading to four hour wait times at some locations for voters. The issue was due to "unprecedented turnout," according to Prince George's Board of Elections. Turnout across the state was up over 2014's Mid-terms. You can look at your precinct's turnout in an interactive map here. You can view the complete statewide results below (If results do not load, click here). Get election results from across the entire DMV here.